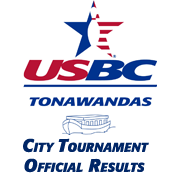 On Sunday, March 17th the Tonawandas USBC held its 54th annual Youth Singles Championship Tournament at Classic Lanes in Tonawanda, New York. This year, 93 bowlers competed in six divisions based on their average. The Girls division A Scratch title went to Sarah Radt who bowled a 665 set. The first place with handicap title went to Alyssa Snowman with a 775 set. Melissa Large (715) and Sydney Skimmer (707) took the second and third place with handicap honors respectively. Cameron Stark rolled a 653 set to win the Boys A division scratch title. The first place with handicap title went to Parker Phillips who rolled a 788. Lane Marlatt (783) and Joseph Coleman (744) finished second and third with handicap honors respectively. In the Girls division B, Elizabeth Beamer rolled a 543 set to take the Scratch title. A 761 set with handicap allowed Rachel Marx to take the first place with handicap title, while Larissa Farrell bowled a 743 set to earn her the second place with handicap honors. Third place with handicap went to Emma Snowman (734). A 529 scratch set earned Callen Neeson the Scratch Boys Division B title. Nicholas Grabowski rolled a 725 set for the first place with handicap title. Kevin Hamilton's 723 set earned him second place with handicap ahead of Charles Buttery (719) who finished third. Daphne Adams rolled a 409 set to take the Girls division C Scratch title. The first place with handicap title went to Patience Burdick who rolled a 699 set. Isabella Carmichael (658) and Elizabeth Schilling (644) finished second and third respectively. The Boys division C Scratch title went to Eric Wolf who rolled an amazing 558 set. This was a whopping 186 pins above his average. Anthony Benedetto rolled a 756 set with handicap to take the first place with handicap title. Dominic Eckrote (739) got by L. J. Heppner (738) for the second-place title, while L. J. took the third-place title. The Tonawandas USBC thanks Brian Borowski and his staff at Classic Lanes for hosting this year's event. Joseph Colson (222); Eric Wolf (221); Samantha Michlin (218); Parker Esch (218); Nicholas Pusatier (216, 200); Evan Bush (214); Elizabeth Beamer (211); Ryler Mnich (210); Dominic Eckrote (209); Paige Bartosz (209); Tommy Chrzanowski (208, 203); Chloe Strong (207, 201); Mackenzie Hutchins (204); Kaelynn Weber (204); Callen Neeson (203); Nicholas Coleman (202); Peyton Anderson (202). Division A Girls: Scratch - Melissa Large (1,932); 1st w/hdcp - Alyssa Snowman (2,160); 2nd w/hdcp - Sarah Radt (2,063); 3rd w/hdcp - Sydney Skinner (2,039). Division A Boys: Scratch - Michael Weber (2,131); 1st w/ hdcp - Joseph Colson (2,307); 2nd w/hdcp - Skyler Randall (2,256); 3rd w/hdcp - Tyler Wells (2,245). Division B Girls: Scratch - Elizabeth Beamer (1,642); 1st w/hdcp - Larissa Farrell (2,240); 2nd w/hdcp - Rebekah Colson (2,109); 3rd w/hdcp - Megan Adams (2,045). Division B Boys: Scratch - Callen Neeson (1.596); 1st w/hdcp - Andrew Wolfe (2,173); 2nd w/hdcp - Nicholas Grabowski (2,151); 3rd w/hdcp - Charles Buttery (2,124). Division C Girls: Scratch - Daphne Adams (1,168); 1st w/hdcp - Elizabeth Schilling (2,045); 2nd w/hdcp - Victoria Pompeo (1,969); 3rd w/hdcp - Shawna Swanson (1,968). Division C Boys: Scratch - James Myers (1,346); 1st w/hdcp - Carson Kwiatkowski (2,199) 2nd w/hdcp - Noah Burgio (2,097); 3rd w/hdcp - Matthew Jackson (2,094). All Bowlers listed for All-Events will receive scholarship money in a SMART account based on the place they finished. This years Youth Banquet will take place on Wednesday, May 22nd. Invitations to all award winners will be sent out soon. This website and its content is copyright of Tonawandas USBC Association - © Tonawandas USBC Association 2011. All rights reserved.